… Well, until I got a message through facebook, inviting me to the “Modern women’s portraiture” workshop at CreativeLive – with Sue Bryce, Lou Freeman, Lara Jade and Emily Soto – the four currently most-renowned women photographers in the world! This was an event unrelated to WPPI, but “accidentally” going on at the same time in Las Vegas, and only a couple of blocks away from MGM Grand, the WPPI site. The next day early morning I was there at the gate to the CreativeLive studio, waiting with coffee in my hand and a heart full of hope. This was actually the event I really wanted to go to, but all spots were gone the moment it was announced and I had no hopes of ever getting in. I did not even realize I was on the waiting list, and someone must have camcelled so I got the invitation. 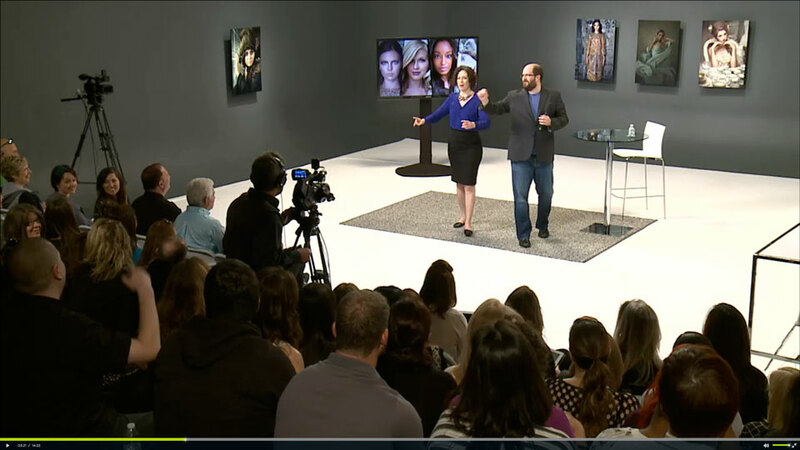 I had no more regrets about my WPPI classes – this was so much better! I spent the next few days in the audience’s front row at the studio with the four best women’s photographers in the world. 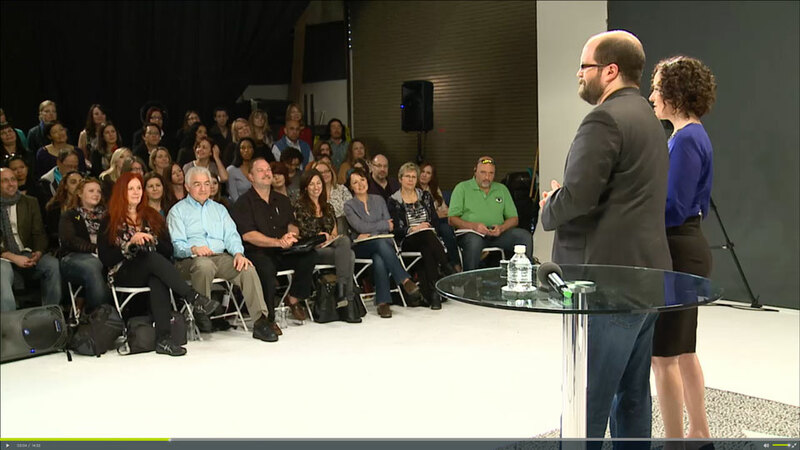 Actually – the whole world could watch me (in the audience) because the event was streamed live on the internet – through the CreativeLive website. There was no one in front of me except the speakers, so I had the impression that they were talking straight to me: about business, marketing, studio logistics, lighting, photographing techniques, posing, retouching – everything I should know. Many topics were already familiar to me, some were new, some were excellent tips, some I did not like at all. Anyway – I felt very special. On her own, an average woman has only two expressions for the camera: a really smiling and a terrified one. As usuall, Sue was very inspiring and empowering. Every time I listen to her, I am reminded that I am a professional photographer – not because of the things I have in my studio, or because of my “pro” gear, but because of the attitude and services that I offer to other people. I sometimes get mixed up in this thinking that I need to get this or that before I will be “truly” a pro photographer. It’s refreshing to be reminded that it’s not the point. On the other hand, Lou Freeman, Lara Jade and Emily Soto inspired me to find out more about what my taste is – what sort of photographs I want to take – to research where my own creativity would take me. They challenged me to develop my own style – be authentic, be bold and dream big. In the end – this experience reassured me in the desire of my heart. I realized again that this is what I love to do – to photograph women and show them how beautiful they are. Moreover, I see this event as a little “hint” from Heaven, that this is what I am meant to do. We are living in a world of ‘not good enough’ – many women believe they have to be a certain size or age to be perceived beautiful. That’s not right – I want to change that! I want moms to be visible on photographs – to exist in pictures for their kids and grandkids. I want to create elegant portraits of them and make them look and feel beautiful – right now and right as they are in terms of size and shape. Beauty is not a matter of conforming to a crazy standard – it’s already in you. If, in turn, any of this inspires you – please know that you are invited for the session with me. Let’s start a revolution! Your words are really inspiring, I like the way you present your work and vocation. Cant’ wait to read and see more! Thank you for your support Laure. The demonstration where she did the same instructions with two different women who couldn’t see each other sounds fun. Thank you for sharing it! It was great to see the difference how. I was simply amazed by how many different ‘faces’ a professional model can do in just a few minutes. You would not believe it! Ooh this looks right up my alley! Loved seeing all the pics too! Great post! You are right, it’s not about having this piece or that piece, but in your ability to capture the realness of your subject and make people feel something when they see you picture. This sounds like such a cool workshop! Thanks for sharing! It was an amazing workshop Leelo. Congratulations! I love the words: Beauty is already in you. Hello! Someone in my Facebook group shared this site with us so I came to look it over. I’m definitely loving the information. I’m bookmarking and will be tweeting this to my followers! Outstanding blog and great design.